A bit of History – Etienne's Astro Blog! My blog on Astronomy and Astrophotography !! My interest in Astronomy started in High School during the early 1980’s when I was a member of the Voortrekkers, an Afrikaans version of the Boy Scouts movement. In the Verkenner (Scout) Handbook it was explained how to find North or South using the stars. Two methods were explained, using the Southern Cross and Orion. Orion particularly sparked my interest. Firstly because it is the most distinct constellation, but more because of the sheer size of it in the sky. Even though my interest in astronomy was sparked at that time, I never had the privilege of doing any astronomical observations. 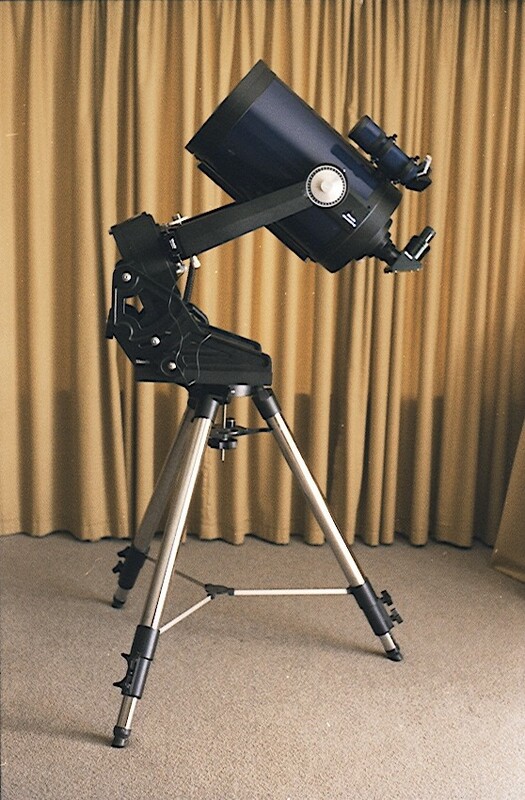 My first opportunity came in 1995 when a colleague at work told me about a telescope he wishes to sell, a 4″ TOWA Newtonian on an Equatorial mount with wooden legs. The interesting thing that happened when he first brought the scope over was when I had my first view of Saturn. The rings were not visible!! The rings were angled in such a way that it did not reflect any sunlight towards earth. While my friend was raving about this phenomenon, I was kind of disappointment with Saturn. Be that as it may, I later had hours of observing fun with this telescope. I even bought a tracking motor from the Johannesburg Planetarium (which was our only telescope shop in those days) for a couple of bucks. So my first scope was already tracking the stars! Having seen the beautiful equipment on display at the Johannesburg Planetarium, by the start of 1996 I was already looking for a bigger scope. 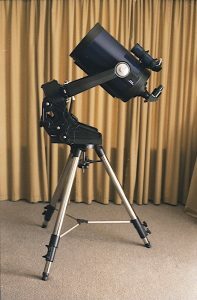 In July 1996, I had a call from Mary Fitzgerald informing me about a guy who wishes to sell his 10″ f/6.3 Meade LX6 Schmidt Cassegrain telescope with super wedge and a lot of extras. I immediately got into my car to supposedly ‘just look’ at the scope, but low and behold, to my wife’s dismay, I drove back with it the same day. This scope gave me years of enjoyment. It was not a GOTO scope, but it had tracking as well as an R.A. and Dec readout. With this readout I could use a starmap, find the coordinates of an object I want to see and move the telescope there. I once found quite faint galaxies that way at my house in Mafikeng. 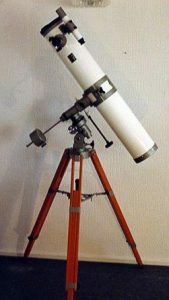 The relatively low focal length of this telescope (1,800mm) made it particularly suited for astrophotography. Although I did take a picture of the transit of Venus in June 2004 with a Pentax 1000, I never really got into astrophotography with this telescope. 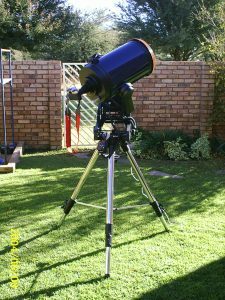 In July 2004 a friend of mine (Tjaart Richards) and I had our first Gemini Star Party, 30 km North of Ganyesa, a town more or less midway between Vryburg and Tosca in the North West Province of South Africa. At this star party a freak accident happened while we were not at the campsite, and my scope was knocked over. I cannot describe the emotion arriving back at camp finding my scope lying on its side. Optically the scope was fine, but the sand got in everywhere into the mount and bearings. We spent hours cleaning out the grease and sand. We managed to restore it to working condition replacing the grease with low temperature carbon grease, but the scope was not the same after. It started to give errors on initialisation and the tracking was off. To make a very long story short, I took the scope to Lynx Optics, who sent it back to Meade in the USA no less than three times. After about a year and a half and some unpleasant emails to Meade, they offered me a replacement scope of similar size and features at a discounted price. 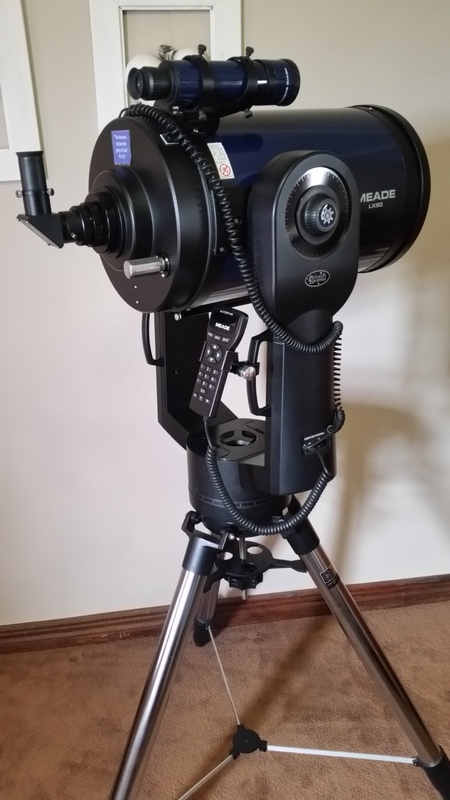 And that is how I got my first GOTO scope, a 10″ Meade LX90 LNT with UHTC.